The example shows how to create a simple line chart. 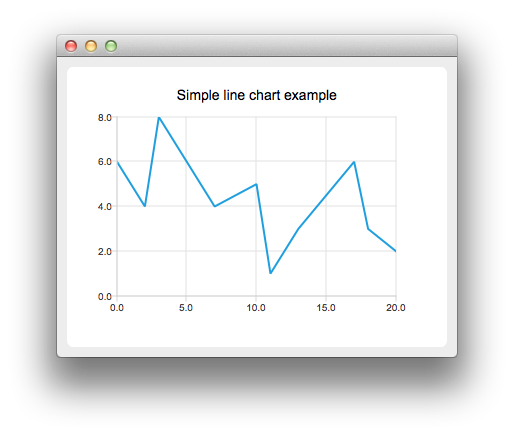 To create a line chart, a QLineSeries instance is needed. Let's create one. Then we add data to the series. We can use the append() member function or use the stream operator. To present the data on the chart we need a QChart instance. We add the series to it, create the default axes, and set the title of the chart. Then we create a QChartView object with QChart as a parameter. This way we don't need to create a QGraphicsView scene ourselves. We also set the Antialiasing on to have the rendered lines look nicer.